From Santiago de Compostela to Finisterre... And home! Well, my journey of one thousand miles has officially come to an end. Despite returning home a few weeks ago, I'm still getting used to the fact that I've finished... It really was an inspirational and life-changing adventure and, as with all good things, it absolutely flew by! 0.0km: The final distance marker at Finisterre, the end of the world. 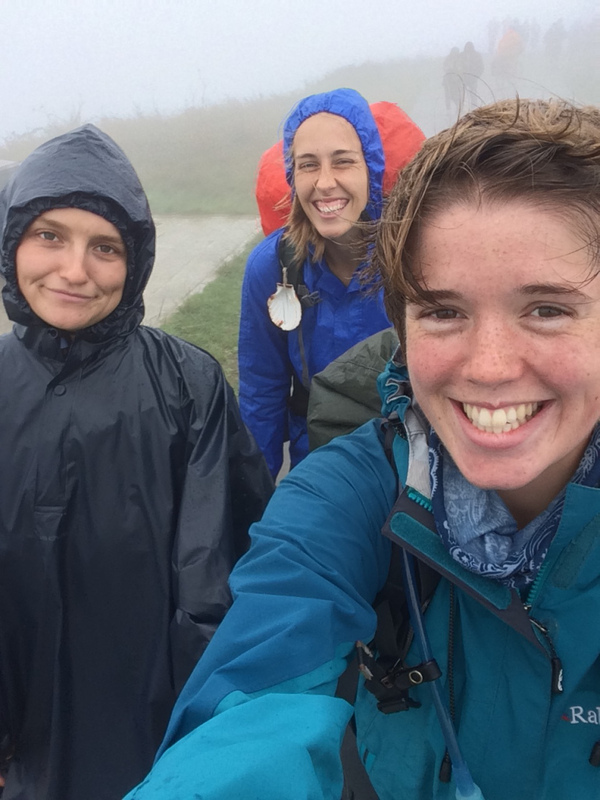 The last four days of walking from Santiago to Finisterre were, simply put, a bit soggy. As I left Santiago, walking away from the cathedral for the first time (a very strange sensation), it began to drizzle... And didn't really stop until I was in Madrid ready to fly home! For the duration of that final leg, we were either walking in rain or thick cloud. With the exception of a couple of particularly heavy rainstorms, this weather was surprisingly beautiful and atmospheric. Embracing the weather with my walking pals Hannah and Bianca! Finisterre, my final destination, is a rocky peninsular that was once considered to be the most western point in Europe, and even before that, the Romans thought it was the end of the world. The name Finisterre derives from the Latin finis terre, which literally translates to "end of the earth". Arriving into Finisterre, this is exactly what it felt like... I had a stone that I needed to throw into the sea (I will explain this in a moment), and as I shuffled across the rocks to the edge of the cliff, the wind was so strong and the cloud so thick I could easily believe I was on the precipice of nothingness - I could barely even see the sea below me! Our first glimpse of the Atlantic Ocean on the west coast of Spain. Traditionally, pilgrims walking the Camino Frances (the route I walked last year) carry a stone with them to place at the bottom of the Cruz de Ferro, a large iron cross. It is carried as a symbol of the internal weight and hardship that a pilgrim bears, and casting it down at the base of the Cruz de Ferro represents leaving this burden behind. As I had originally planned to retrace my steps along the Frances, I picked up a rock just outside of Le Puy on my first day of walking, with the intention of carrying it as far as the Cruz de Ferro. However, as my plans changed and I walked the Norte instead, I decided to throw my stone into the Atlantic Ocean at the very end of my journey. It felt strange to part with that little lump of rock; I'd grown fond of taking it out of my rucksack as I walked, and just turning it over in my hands. Bidding farewell to the stone I carried from Le Puy en Velay all the way to the Atlantic Coast at Finisterre. My final day of walking also happened to be my 22nd birthday! That evening, I went out for a celebratory "we've finished walking" and "it's Anna's birthday" dinner with my new friends Bianca and Hannah (I say dinner, but we actually just ordered a selection of desserts, an appropriate way to end). The table next to us was made up of a large group from Ireland, who, upon discovering it was my birthday, sang Happy Birthday very enthusiastically. Embarrassing as this was, it led to the waiter bringing out a free chocolate cheesecake topped with a candle, so it was worth it! My complimentary birthday chocolate cheesecake! So now it's back to 'reality', which comes in the form of my final year of university! I've compiled a photo album on Facebook that has many more photos than I shared on this blog, which is available to the public (even if you don't have a Facebook account). Take a look here!